I use 3 camera bodies when shooting weddings. I'm usually very careful about syncing the camera clocks before every wedding. I just shot my first wedding of 2014 and it was also the first wedding in about 3 months and forgot to sync the clocks. The clocks in the 3 cameras were not synced and so when I imported the images into a single folder in Lightroom, they are not in proper chronological order. Does anyone know how to correct the capture time of all of the images from a single camera in Lightroom without having to do it one image at a time? Thanks! Excellent link QR, thanks a lot. I sure can use that on my next batch of edits, my 2nd shooter's camera was out by nearly 50 seconds, that's a big difference when shooting a certain scene 1 minute then suddenly I am shooting something else but his files then start to come in on that different scene from the previous. Do you still have access to all three cameras? If I were in your position I would open the Clock utility on your computer, and use each camera to take a photo of the clock. Then by comparing the time shown in the photo with the timestamp in the EXIF metadata you can calculate the "drift" or difference for each camera precisely. You can then use the precise time difference to adjust the files taken with each camera. I absolutely do NOT recommend using Lightroom to adjust the time for your files. Instead I suggest, removing the files from Lightroom and using a utility like EXIFTool (free) or Attribute Magic Pro to correct the times, then re-import the images into Lightroom. Hopefully you haven't started processing them or your work will be lost. (1) Lightroom's handling of time and date changes is not robust enough. 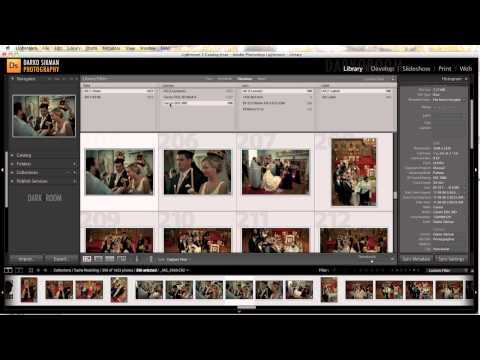 I would personally use a tool like EXIFTool or Attribute Magic Pro over Lightroom to make changes. (2) Lightroom's changes to date and time for raw files are saved in its internal database unless you specifically instruct it to write the changes to the file; so time and date changes are not automatically reflected in the search function of your operating system (Finder or Windows Explorer). And you'll probably also have to allow write access to the files if they were originally read-only. (3) An operating system can display at least 10 time fields associated with an image file; fields like Date, Date Created, Date Modified, Date Taken, Date Acquired, Date Last Saved, etc. Lightroom is incapable of changing all these time and date fields and this can cause screwy results if you're using Finder or Windows Explorer to do complex date searches or file sorting outside of the application. For example, if you use the option to "Change to file creation date for each image," Lightroom will change fields like Date Created and Date Last Saved, but it will not change the two important fields generated by the camera - Date, and Date/Time Digitized. Similarly if you use the "Adjust to a specific date and time" option, Lightroom will not change the Date Taken field. So in my opinion there are much better file attributes editors that can make these adjustments to the Time and Date fields of your files, then import the files into Lightroom.